Massa on pole ahead of Alonso, Raikkonen, and Hamilton... Good race toonight. Can twist a headline like this: Hamilton outshines Raikkonen win. Compared with the Spanish and Italian versions. Kimi wins his maiden race with a Ferrari! Amazing! Kimi not only finishes but wins the first race! I lost my bet. What does it mean? Well, first it may mean that Ferrari is more reliable than McLaren was last year, it may mean that Kimi has matured and learn how to drive a car to the finisg line, we won't know until later this year. But both McLaren finished the race, with Alonso providing one of his usual "if you can't win be consistent" performance and Lewis Hamilton having a great debut. Kimi race is amazing, it isn't easy for a driver to win the first race in a new car, in a new team. Are the McLaren more reliable than last year or just lucky? For now the only thing we can be sure of is that Alonso, the overwhelming favorite, will start with a handicap in points. Another salient feature of the race was Massa's amazing effort from 22nd to 6th. That may show the real state of Ferrari in this new times of single marquee tires. BMW did not delivered on the promise and Renault proved to be a team built around a driver they no longer have. Which brings me to my negative comment on the race. The elephant in the room that nobody is mentioning: Team orders. Does anyone really think that Alonso's pit overtake of Hamilton wasn't manufactured by McLaren and ordered by Ron Denis? I prefer the openness of the previous year in Ferrari rather than the unbelievable hypocrisy of this new "no first driver" era. Massa Wins Race, Alonso Wins Title, Schumcher Wins it all! In his last race ever Shucmaches had to suffer, but sometimes those are the best races for champions and we had a great race today. Yes, Massa won in his home turf which is great, Alonso won the championship and kudos go to him. But Schumacher said goodbye to racing showing he is still the best racer of them all. Incredible passes and from last to fourth place in amazing form. This will go to the annals of racing and Schumacher will become a legend. We will tell our kids we saw him race, I'll even be able to say I saw him race live (at Indy 2000). For a while we will hear about his shortcomings, about he being a flawed champion, and some will remind us of his aggressive tactics and the times he was caught cheating. But in time that will be forgotten (remember Fangio? ) and that is a pity. Because I prefer heroes that are human, like Schumacher, like Maradona, like Sena. They are much better than the perfect unreachable demi gods that most champions pretend to be but aren't. There are heroes up there and heroes down here, but the best heroes are the ones that have a little in heaven and a little in earth. Thanks Michael for being the best racer ever and still being a human being. Schumy blows engine, Alonso pretty much champion! Schumacher wins against all odds. 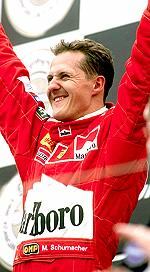 Whatever you can say about Schumacher you have to say he is the best driver in the world. He has achieved more than anyone before him and I don't think I'll get to see a driver as good as him ever. yes, he is not perfect, he is even human! But that for me just makes it more interesting. He is the greatest! Thanks for the memories! Engine betrays Alonso after he does the hard work! Alonso was the best racer, with a new engine in a very reliable car. From 10th place, after a harsh penalty, he was third behind Kimi and Schumy. But his engine blew up, something it hasn't done in a while. With that Ferrari is first in the constructor champions and Shumy is only two points behind Alonso. Exciting last three races! We've seen the best four laps of the last decade of F1 racing. I was right to wish for rain, not only because the weather pleased me, but because it has made the race much more interesting. Alonso demonstrates again that he is one of the great ones. Yes, the Michelin tyres are better on this semi-wet. But Alonso was better than everyone, including a pass to Schuamcher that has to be one of the best ones. I'm glad and I wish all the races were like these first four laps. Great race for Ferrari and for Kimi. It is clear that something is happening with Alonso. I don't think it is the mass-damper removal. I think it has to do with the key of the past two seasons: Tyres. Michelin is leaving F1 and, clearly, has fallen behind in development. Something that has been showing since last year Indy. Last year it had a further advantage in that cars weren't allowed to change tyres during the race. It would have been another story if these schizo rule changes didn't occur. As proof of what is happening with tyres, look at the races of Trulli and Webber. Yes, Webber couldn't finished, but he was doing great. See you next week. Still in hight heat. I leave you with this question: How come we haven't seen rain in a race for the longest time? Only one with eight in one place! Ferrari (Italy) beats Renault (France) In French soil! in what the French had claimed would be the revenge for the World Cup Final last week. No head-butts this time, we have to wait and see if the italians will be called cheaters (again). Jests aside... Great race for Schumacher, that shows that Indianapolis was more than I thought. Great also Alonso, changing strategy midway in order to get a very valuable second place. At this rate, Alonso is still champ, but at least it seems that things may be closer than they appear a few weeks ago. In the intensity of the race for second place, Ferrari and Schumacher seem to have lost the script where it clearly says Alonso will win. And all red front row. We have to wait and see the reality of the race tomorrow, but very clearly it will be worth watching. Hmmm... Italy beats France? Again? It's getting monotonous.